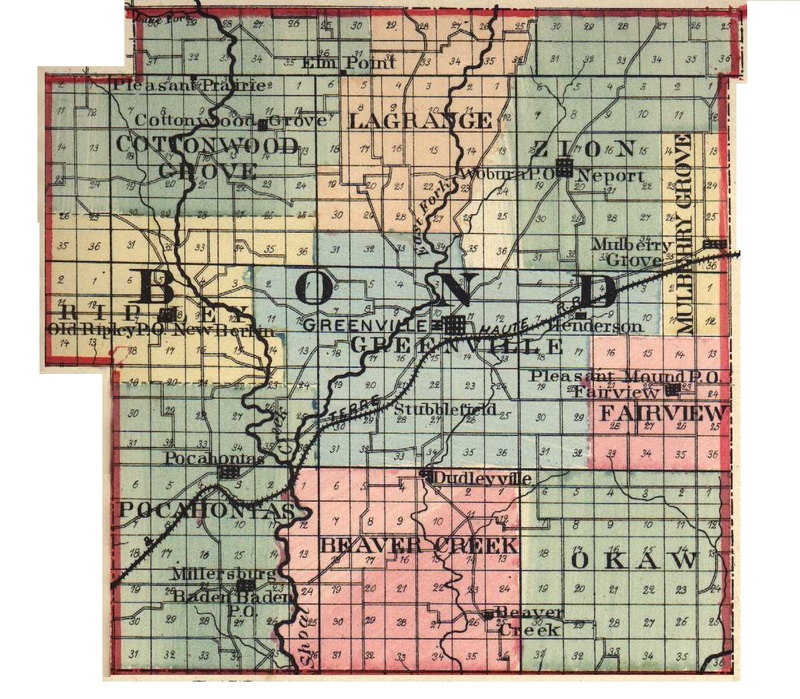 T. S. HUBBARD, a prominent and successful settler of section 6, ranks among the old inhabitants of this part of Bond County and resides in the township of Pleasant Mound. He is a native of this State, having been born March 9, 1815, in Madison County, Ill. The father of our subject bore the name of Peter Hubbard and was born February 23, 1782, in South Carolina. He was reared at his home until he reached the age of nineteen, when he became ambitious to see something of the world, and started out on a prospecting tour. When he reached Tennessee he was pleased with the country and remained there four years, but about that time the people became impressed with the value of the rich lands to the northwest and he was among those who came to Illinois in 1809. Mr. Hubbard remained a short time in Monroe County, but the next year removed to Madison County, and in 1817 he came into Bond County and took up about fifteen hundred acres of land. On this place the father of our subject remained until the close of his life, his death occurring at the age of eighty-seven years. He was one of the earliest settlers of the county, and held some of the most important offices, having been made County Commissioner and County Treasurer. In politics, he was a prominent Whig and was one of the largest land-holders in that part of the State. Mr. Hubbard was descended from Welsh ancestors, although Peter Hubbard, his father, was born in South Carolina, in 1756, and was a Revolutionary soldier. The mother of our subject was also a native of the Palmetto State, and her name was Martha Gilham. She was born in 1792, reared in her native place until eight years of age, and in 1800 came to Madison County, Ill., living to be sixty-two years old. She was married to Mr. Hubbard February 11, 1812, in St. Clair County, Ill. Her father was Thomas Gilham, a native of South Carolina, who with his four brothers was among the early settlers of Madison County. Mr. and Mrs. Hubbard were the parents of eight children, three daughters and five sons, and four of them are still living. Our subject is the eldest son and second child of the family. He was two years old when he came to Bond County, and his first recollection of school is of a log house in Greenville, with slab seats and dirt floor and greased-paper windows. Some of the more aristocratic edifices had puncheon floors and stick chimneys, and some had teachers whose knowledge did not much exceed that of the pupils. If history tells the truth, some of those same schoolhouses were stages whereon were enacted scenes which, if accurately described, would often seem incredible. The many drolleries in the midst of unlicensed despotism are remembered with mingled feelings of amusement, disgust and resentment. At the age of twenty-one, he took a course at the Jacksonville College, after which he returned home and remained until his marriage. The lady who became Mrs. Hubbard was a native of Virginia, born May 19, 1821. Her name was Ann E. Saunders, and she became united to Mr. Hubbard February 2, 1843. When about seven years of age she was taken to Pennsylvania by her parents, and came to Illinois in 1839. Immediately after their marriage, our subject located where he now resides. He had his house partly finished on the Government land which he took up in 1830. There were no improvements whatever on the place when he took charge of it, but he was very energetic and got out the timbers of the house and built it almost alone; and so thoroughly was the work done that it has sheltered him and his growing family all these years. Mr. and Mrs. Hubbard are the parents of eight children, of whom three are daughters and five sons. They all grew to maturity with one exception, Emma, who died at the age of twenty-one months. Those living are Lewis, who resides in Smithboro; Julian, who resides in Northeast Kansas; Lavinia became the wife of James E. McDowell and resides in Chicago; Henry A., who resides in Greenville; George C., who resides in Ida County, Iowa; Alfred C., who resides at home; and Mary J., who became the wife of L. Armstrong, of Greenville. Our subject had at one time a farm of six hundred and fifty acres, but he has divided it with his children and has only retained one hundred and seventy for himself. He has always been a strong Republican and voted in 1836 for William H. Harrison, and again for him in 1840. Mr. Hubbard has done surveying in the county, as Deputy under the County Surveyor, and has been Township Trustee and School Director. For many years he has been an important member of the Congregational Church of Greenville, of which he is now Deacon and of which he has been Trustee. Extracted 20 Dec 2016 by Norma Hass from 1892 Portrait and Biographical Record of Montgomery and Bond Counties, Illinois, pages 417-418.